This large format coffee-table book traces the history of a distinctly Australian fishing boat and culture. This hardback book, by Michael Innes and Steve Burnham, records the rich but almost forgotton story of the classic couta boat that fished the stormy waters of Bass Strait off Victoria’s west coast. More than 200 previously unpublished photos and scores of fishermen’s tales chronicle a voyage of rediscovery. Along the way, the “couta coast” appears, an important addition to Australia’s maritime heritage and historical record. Michael Innes learnt to sail on the lakes of western Victoria before adopting Port Phillip as home and his stretch of coast. An interest in traditional, wooden workboats lead Michael to the Lonsdale, a 1935 Queenscliff Peter Locke couta boat. It was on the market and he couldn’t resist. Steve Burnham is from a fishing family that settled along the Sorrento and then Rosebud coastline at the southern end of Port Phillip around the turn of the last century. He now owns and sails one of the boats originally owned by the fishing business Burnham Bros, established by his father and three uncles (a couta boat, built by Alec Lacco). First Home: The Couta Boat and Victoria’s Couta Coast is the culmination of a project begun by Garry Kerr, OAM, following the publication of his book Craft and Craftsmen of Australian Fishing, 1870-1970. Garry interviewed fishermen and boat builders, some of whom are no longer alive, and also commissioned a number of essays on the history of the couta boat, their ports and fishing families. 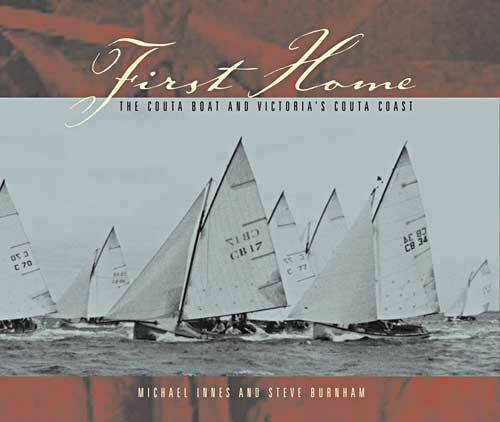 The book First Home, also a first for both Michael and Steve, took shape across four years and in tracing the evolution of the couta boat from the 1860s to the present day, a new narrative about the Victorian coastline emerged. The oral histories documented in this book also tell of a significant cultural landscape that has come to be termed the couta coast. Available at Boat Books Australia. See this page for store locations and contact details.